Seward head coach Bryan Zollinger says this should have been a 20 point victory. The Saints built an 18 point second half lead, saw that lead widdle down to four, then held on to beat New Mexico Military 68-62 Saturday afternoon at the Texan Dome in Levelland. Seward led 40-26 at the half playing some of their best ball of the season. 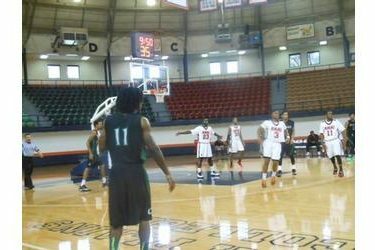 Jamal Poplar scored 25 points with seven rebounds. Kevin Sims added 17. Secean Johnson fought off foul trouble for 10 points. Seward shot 38 percent but forced the Broncos (4-4) into 21 turnovers and 39 percent shooting. Seward is 3-5 and has won three of their last four. Seward faces Eastern Arizona at Yuma Friday at 4:30. Seward plays Western Nebraska Saturday at 8:30 in Yuma.